I came to love the newspaper. Today’s drive was the purpose of the this guys’ trip. The boy wonder picked Colorado as the destination because he wanted to see the house where I grew up. After breakfast off Pearl Street and a few hours roaming the stores there, we hopped in the speederbike-like rental car and hit the hot spots of my youth. We drove by the music school at CU, stopped by my high school, saw a handful of the baseball fields where I shagged flies and played games, visited the middle school I attended and his grandma worked, wheeled by the building that housed our Boy Scout meetings, looked a the cul-de-sac we once turned into a mountain of snow for one epic game of King of the Hill … and visited my boyhood home. Ian said the house was pretty, and he was especially happy to see all the kids walking home from elementary school and three kids — three! — darting into my former home. I felt uncomfortable loitering, so I took the quickest way out of the subdivision that I knew — the route I biked each day to get the newspaper. As we reached Hoover’s intersection with Bella Vista Drive — it is Bella Vista! — I looked to the corner for the single-copy boxes out of habit. I am, proudly, the product of the newspaper war. I wasn’t at the Rocky long enough for the war to shape me professionally, but it sure did mold me personally. The ink in those days was contagious. Throughout my life in Colorado, the Post and the Rocky waged an epic battle for readers and news. Choosing which Denver paper was your own was not something taken lightly. You were enlisting. Sure we all subscribed to the Camera and the weekly Louisville Times in the same we all attended school together, out of necessity. But the Post or Rocky was a choice, like selecting a political party, picking a favorite mountain to ski, or deciding on a favorite Three Amigo. (I was a Mark Jackson guy.) The paper you picked said something about you. The Rocky was a tabloid, and came in easy pull-out sections after awhile. The Post was the broadsheet. The Rocky was the oldest paper in the region. The Post momentarily lured me away with its plan to “adopt a major-league team.” On the top of the sports page, the Post listed the numbers to call to vote on what team would be “adopted” by the paper and covered like a local beat. I spent evenings dialing the number for the Yankees. The St. Louis Cardinals, in an upset over the Chicago Cubs, won. It was back to the Rocky for me. The box scores were better. It was through the box scores, though, that I discovered the rest of the sports section and continued to fall for the wonder of newspapers. I looked forward to Drew Litton’s cartoons, highlighted favorite sentences in Bob Kravitz’s columns, and, whether I realized it or not, started shaping a fondness for newspapers and baseball coverage that would inspire my career. The opportunity to compete was a big part of that, and the newspaper war brought that competition directly to my favorite newspaper box. When the duel between the Post and the Rocky was at its most-heated, there were more than 400,000 subscribers to the newspapers. Subscriptions could be had for a $1 a year or a penny a day or something like that. I seem to recall one of the papers actually offering lifetime subscriptions. Winning mattered. The seeds of newspapers as a form of competition were planted each time pulled a Rocky out of that single-copy box and they eventually blossomed in South Florida during my internship with The Palm Beach Post. There are few moments in my professional life that can match the day that the Rocky offered me a job. I was not only going home, I was pledging final allegiance to the paper I grew up reading, the paper that helped inspire to be a newspaperman. The sadness I felt on the day of the ceasefire — the day the Rocky surrendered Sunday to the Post and the two papers joined forces against an uncertain economic future — and the heartsick sensation I had when returning to Denver after the Rocky died can be traced to the delight I had each day plugging quarters into that single-copy box. Look, I get progress happens. Baseball coverage has never been better. Fans have real-time access to news, scores and stats — as they happen. A few times this winter, I’ve covered negotiations as they happened, from offer to acceptance to physical to completion. This kind of coverage wasn’t possible when we had to wait for the morning paper to break news. The Internet has made us all better reporters, and perhaps even better writers. Certainly we’re all faster typists. 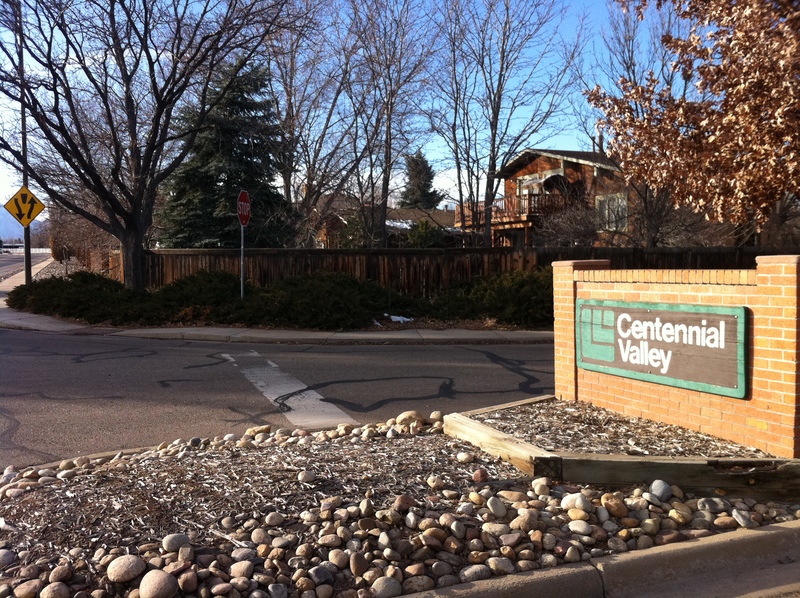 The corner of Hoover Avenue and Bella Vista Drive in Louisville, Colo. The newspapers that stood sentry here have retreated, surrendering the corner. This entry was posted in baseball, boy wonder, journal, journalism, newspapers, project 365+ and tagged baseball, boy wonder, journalism, louisville, newspapers, rocky mountain news by dgoold. Bookmark the permalink. Ah, the old ‘hood. That’s the corner we’d go to for the Louisville Times, unless we were feeling up for an urban assault and headed downtown or at Hoover & Pine so we’d get the downhill ride on the trip home. Hope the Boy Wonder enjoyed the trip down your memory lane.